Safety of our children, pets, homes and others is a major area of concern in most of our lives. Turfgrass can help to create safe environments for everybody. Here are a few ways lawns can make our lives a little bit safer. The typical Columbus lawn is maintained between 2-4” tall and ideally is green and full of life. A lawn such as this creates a great barrier to fire. Although we do not typically have wild fires in Columbus, this is another benefit to our lives. Having less above ground biomass creates less fuel for fire to burn. Creating a healthy lawn to separate wooded areas, is creating a security blanket to your home. A healthy lawn that is actively growing will also contain moisture in the leaves. As most people know, its a lot harder to start a fire with a wet fuel source. Turfgrass is also beneficial for deterring vandals and intruders. An open area, such as the one your lawn will create, removes areas for any unwanted visitors to hide. Perhaps something you have never thought of, this idea does make sense. 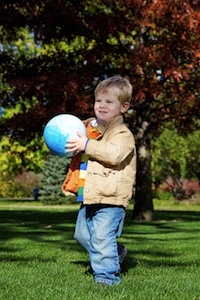 Healthy lawns also create a safe playing surface for little ones and pets. A thick, lush lawn will provide an area where it might not hurt as bad to fall. There is a reason that many of the most popular sports such as football and soccer are played on soft, turfgrass surfaces. Finally, lawns are used extensively along road sides in Ohio. Although we never anticipate an automobile accident, in case of emergency, there are often areas where a quick diversion into turfgrass creates a softer landing than into a tree or roadside barrier.